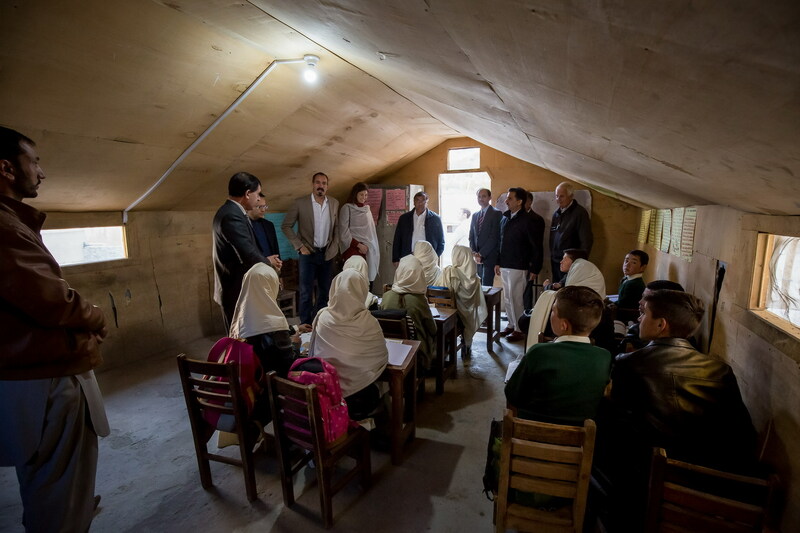 In the mountainous north of Pakistan, Prince Rahim and Princess Salwa visited several schools operated by the Aga Khan Education Services (AKES), as well as community-managed schools, where they spent time with students, teachers and management. In Ghizer district of Gilgit-Baltistan, these included the Diamond Jubilee schools in Darkut (Silgan valley) and Bilhanz (Ishkoman valley), and the Aga Khan Higher Secondary School in Gahkuch (Punial valley). In the remote mountainous areas of the country, AKES schools have contributed significantly to increasing access to quality education. Prince Rahim and Princess Salwa also surveyed disaster-mitigation work in areas vulnerable to natural hazards. Many villages in the mountainous north of Pakistan are vulnerable to flash flooding. In Gilgit-Baltistan in July 2018, unusually warm weather caused intensified melting of snow and glaciers which resulted in a large glacial lake outburst flood (GLOF) which submerged farmland and destroyed houses in Badswat and Bilhanz villages (Ishkoman valley) in Ghizer district. The Aga Khan Agency for Habitat (AKAH) has been supporting the local community by providing humanitarian assistance and relief. Prince Rahim and Princess Salwa also surveyed community-based mitigation work, including the construction of stone wall flood defenses, undertaken in the aftermath of an earlier disaster in the village of Darkut (Silgan valley), in Ghizer district of Gilgit-Baltistan. Given the importance of energy in catalysing development, Prince Rahim and Princess Salwa visited the Ahmedabad community-based hydropower project on the banks of the Hunza River in the valley of Central Hunza in Gilgit-Baltistan and the Mogh community-based hydropower project in Garamchashma in Chitral district of Khyber-Pakhtunkhwa. The Aga Khan Rural Support Programme (AKRSP), along with other partners, has contributed to both projects, which can help protect the environment by reducing the felling of trees for firewood, a cause of soil erosion. In addition, the electricity generated by the hydropower plants provides light for students to study after nightfall, and can reduce time spent on household chores. 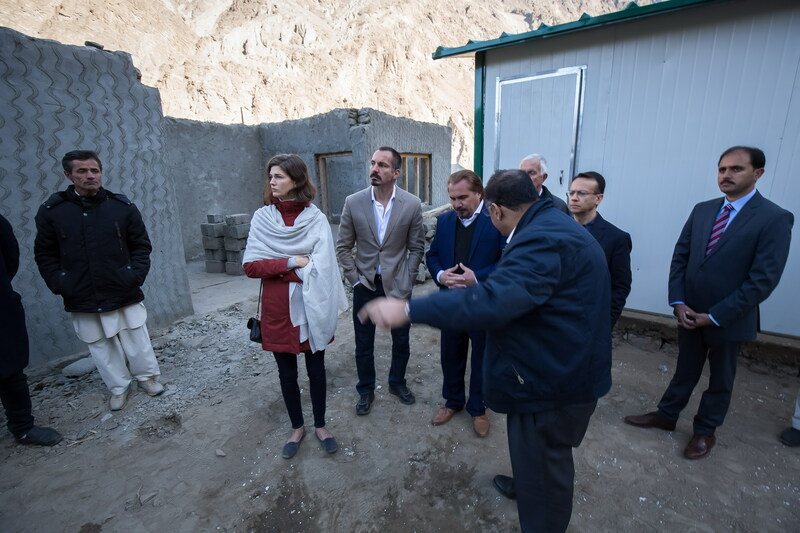 While in Chitral district, Prince Rahim and Princess Salwa visited the Aga Khan Girls Hostel in the village of Booni, which provides accommodation for female students from remote villages, and the Aga Khan Medical Centre Booni. In Garamchashma, Prince Rahim and Princess Salwa also visited the Tehsil Headquarter Hospital, which is operated by the Aga Khan Health Services (AKHS) under a public-private partnership agreement. Both medical facilities, in Booni and Garamchashma, are part of a “hub and spokes” model of healthcare delivery connecting centres, including the Aga Khan University (AKU) Hospital in Karachi and standalone clinics in remote areas, through telemedicine and e-health services. This link allows for the remote treatment of patients and training of medical staff, minimising barriers of distance and time, and facilitating access to high-quality health care in isolated areas at an affordable cost. In Karachi, Prince Rahim and Princess Salwa spent a day at the Aga Khan University (AKU) where they toured the new Centre for Innovation in Medical Education (CIME) and heard presentations on childhood malnutrition and stunting, youth mental health, and stem cell research. While in Karachi, Prince Rahim and Princess Salwa also had further discussions with our local leadership on poverty alleviation and development.